Is a Cochlear Implant Right for Your Child? Cochlear implants are devices that may help your child hear. If your child is Deaf or has profound hearing loss, consider talking to his doctor about cochlear implants. Sometimes called “bionic ears,” cochlear implants are not a cure for hearing loss. 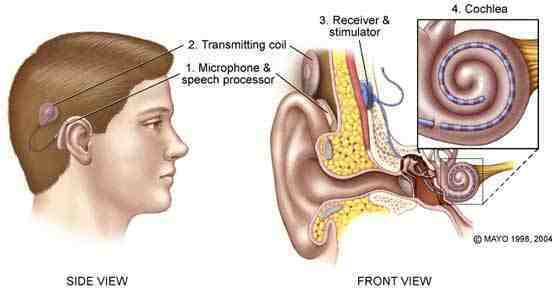 Whereas a hearing aid amplifies sound, a cochlear implant will bypass the damage in the ear to stimulate the auditory nerve directly. The brain can then interpret the signals sent by the nerve as sound. It can take quite an adjustment to learn to use a cochlear implant, but these little electronic devices can help your child develop speech and language at a rate on target for his age group.